I love Risotto. My favorite is with white wine and seafood. Sometimes I just reminisce about those good ole days mom would make this. It's one of those comforting Italian foods when I was growing up. I would come home from school and oh that smell of sauteed garlic hits me in the face on a cold blustery Upstate N.Y. day that would put a huge smile on my face. This is the recipe that made that happen. Combine the wine and chicken broth and set aside. In a large fry pan on low heat, add butter and oil saute garlic 1 minute. Add the rice saute until golden brown, around 6 to 8 minutes. Add half the broth/wine mixture and stir constantly adding a little more of the broth mixture leaving around 1/4 cup of the mixture for the shrimp. Cook rice until it continues to absorb the broth mixture and it thick and creamy, (if using the pesto add now). The rice should continuously be stirred. It is cooked when it is neither too hard or too soft. This took around 40 minutes total. Turn off the heat and let rest. In a another fry pan melt 2 tablespoons butter, 1 tablespoon extra virgin olive oil add 3 teaspoons crushed garlic, saute 1 minute. Add the shrimp and 1/4 cup of broth mixture. Cook around 5 minutes or until shrimps turn pink. 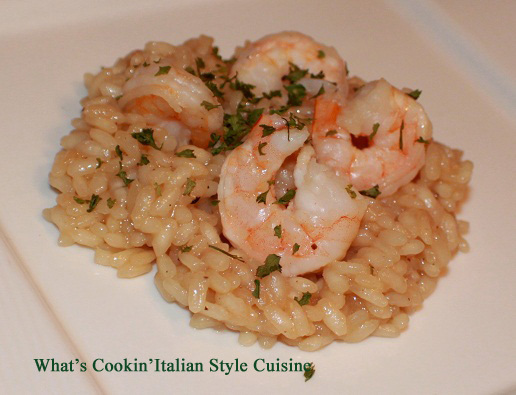 Scoop rice onto a plate, top generously with shrimp. Garnish with parsley and serve. This sounds awesome. 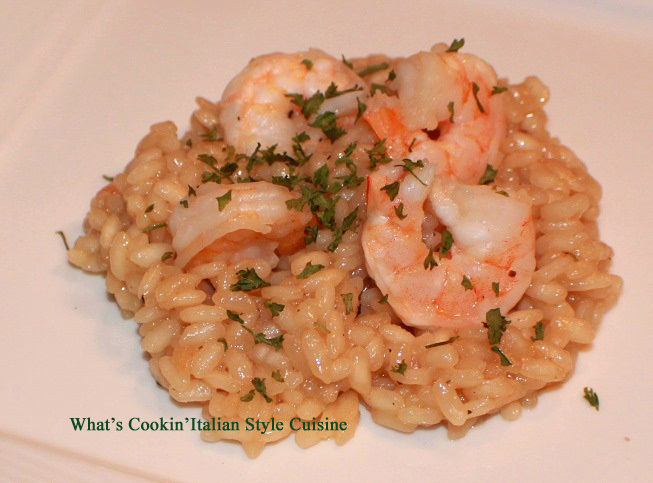 I made risotto with shrimp, scallops and lobster for Valentines Day. Love the seafood and rice combination. I've only made risotto one time and I think it turned out well, but seeing this I may have to try another batch. Love this and I bet your risotto is the best. Have a great weekend!